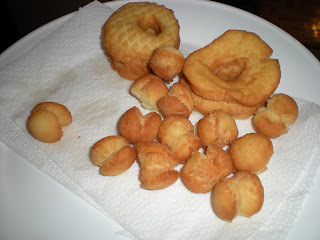 Random Cuisine: Sour Cream Doughnuts and "Doughbits"
1. Sift together flour, salt, baking powder. 2. Beat eggs in a large bowl, then beat in sugar, 1 tbsp at a time, until pale, thick and creamy. Stir in sour cream, milk, butter, marmalade, zest. Blend well. 3. 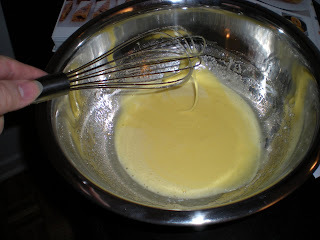 Carefully fold in spoonfuls of flour mixture until just combined. 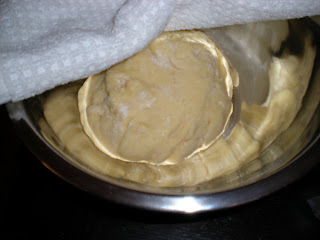 With lightly floured hands, shape dough into a ball and cover with a towel. Let it rest in a cool place for 20 minutes. 4. If the dough sticks, roll out on a lightly floured surface. Roll it out to a 1 inch thickness. Using a cutter (or mug or glass), cut out large circles, then stamp out the center with a small cutter (or plastic bottle cap). 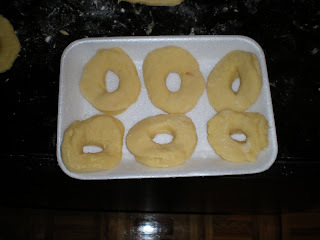 The stamped out dough can be used for 'doughbits'. Gather up the scraps, knead together, roll out, and cut out more rings. Add more flour on surface if it is still sticky. 5. Heat oil for deep-frying to 350F. 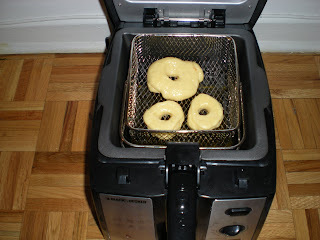 Gently add doughnuts to hot oil, two or three at a time. They must not touch each other. Fry until golden brown, about 1 1/2 mins per side. 6. Lift out and drain on paper towels. Dust with icing sugar, spread with your favorite jam, coat with chocolate or shredded coconuts.